Each with its own distinctive charm, our Manor Dining Room and Bistro both provide superb culinary experiences and impressive wine lists. Led by Swiss Executive Chef, Marcel Kauer, our gifted kitchen team never fails to delight the palate while also providing a feast for the eyes with their exquisite presentations. Honoured with a 4-Diamond rating every year, the Manor Dining Room offers a prix fixe menu for an exclusive dining experience. Enjoy an intimate community cocktail hour in the living room before joining us for an elegant three-course meal. Seating is open between 5:00 PM and 8:00 PM each evening, attire is smart-casual. Reservations are required and it is strongly recommended to book early. Cancellations must be made by 2:00 PM on the day of reservation. Adjacent to the historic Manor House, our light-filled verandah provides the ideal venue for our casually elegant Bistro. 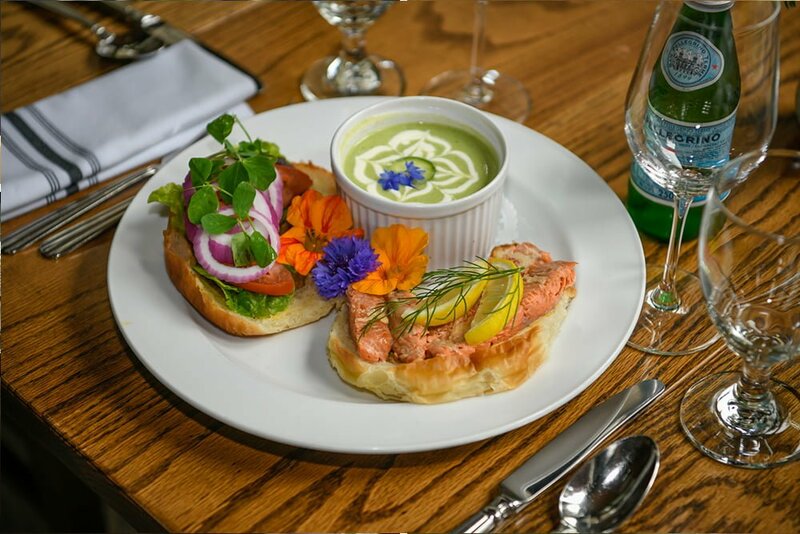 Featuring a relaxed ambience with inspiring views over Ganges Harbour, the Bistro’s à la carte menu offers a selection of tasteful dishes influenced by the freshest ingredients from our onsite gardens and local farmers. The Bistro is available for seatings between 5:00 PM and 8:00 PM each evening. Reservations are strongly recommended. For dinner reservations, please call 250-537-2362 or toll-free 1-800-661-9255. Our restaurants feature the freshest cuisine with produce from our own abundant gardens. Vegetables, flowers, fruit, and herbs are often harvested just a few hours before cooking. We are proud that everything we grow onsite is non-GMO and free of any chemical fertilizers or pesticides. “Best cooking in the Gulf Islands” 5 stars. We had two dinners here this summer (it’s a regular stop for us on our summer sailing cruise): one in the newish bistro side and one in the fine dining room. Both were excellent meals with attentive and knowledgeable staff. Beautiful setting with the postcard perfect view of Ganges harbor.